DQ*Plus takes your incomplete data and gives you back updated, complete information. DQ*Plus breaks down names into prefix, first, middle, last name and suffix. 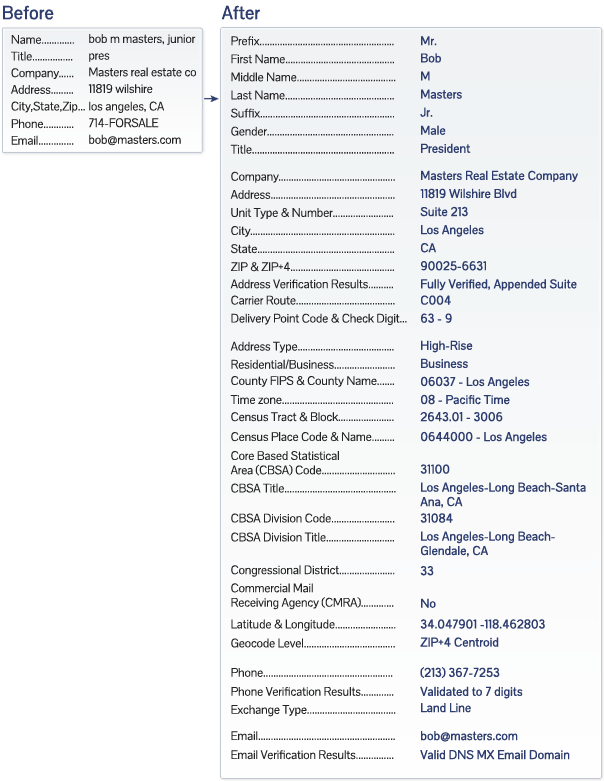 DQ*Plus provides phone numbers for your contact records that have none. DQ*Plus fills in missing area codes and verifies and corrects area code and prefix combinations for U.S. and Canadian phone numbers. DQ*Plus determines the gender of your contacts and provides the appropriate salutation. DQ*Plus provides latitude and longitude coordinates for a given address. DQ*Plus adds U.S. census data to your customer records including population, ethnicity, age, education and income. DQ*Plus provides a data library that searches for and removes undesirable text. This library is editable so that you can modify it to address your specific needs. For more information about the data enriching capabilities of DQ*Plus call (925) 913-4593 or send email.